BBC Radio Lancashire, accompanied by Pudsey, will be visiting Edisford on Monday afternoon (12.11.18) as part of their week long Pedal for Pudsey around Lancashire. 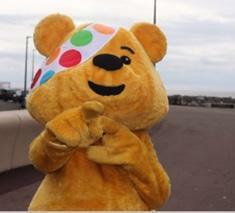 Pudsey and the presenters will be stopping by to chat with children. We'll be sure to take lots of photos!